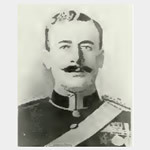 NORWOOD, John, Captain, 5th Dragoon Guards (Princess Charlotte of Wales's) John Norwood won the Victoria Cross during the Boer War in 1899: An extract taken from the London Gazette dated 27th July, 1900 records the following: John Norwood, Lieut., 5th Dragoon Guards. Date of Act of Bravery 30th Oct., 1899. On the 30th Oct., 1899, this officer went out from Ladysmith (S. Africa) in charge of a small patrol of the 5th Dragoon Guards. They came under a heavy fire from the enemy, who were posted on a ridge in great force. The patrol, which had arrived within about 600 yards of the ridge, then retired at full speed. One man dropped, and Second Lieut. Norwood galloped back about 300 yards through heavy fire, dismounted, and picking up the fallen trooper, carried him out of fire on his back, at the same time leading his horse with one hand. The enemy kept up an incessant fire during the whole time that Second Lieut Norwood was carrying the man until he was quite out of range. John Norwood VC was commissioned as a 2nd Lieutenant on 6 Feb 1899. He was promoted Lieutenant 27 June 1900 and Captain 14 April 1904. When the war broke out he rejoined his regiment, the 5th D.G.'s.. on mobilisation. He was in the retirement from Mons and fell in the Battle of the Marne at Sablonnieres whilst trying to help a wounded Sergeant in a manner somewhat similar to that when he won the VC 15 years earlier. He was killed in action during the First Battle of the Marne at Sablonnieres, France, on 8 September 1914. The Official History sets the scene for the day: On the 8th September the tide turned for the Allies as the Germans advance through France stalled and they were pushed back across the river Petit Morin. The 5th Dragoon Guards were at the head of the Cavalry Division, moved by La Ferte Gaucher on Sablonnieres, and the 4th Dragoon Guards on the wooden bridge at La Forge, 2,000 yards lower down. Driving scattered parties of German horsemen before them, they plunged down into the wooded valley of the Petit Morin. The two bridges at Sablonnieres were reported to be lightly held, but a direct advance upon them was found to be impossible owing to the enemy's rifle fire. Captain Norwood married, in 1904, Lilian, daughter of Major- General Sir Edwin Collen, K.C.I.E., C.B., and left two sons and a daughter. He was a member of the Cavalry Club, and his recreations were hunting, shooting, and tennis. He was one of 12 English freemasons who were VC winners and who were killed in the Great War. The others were BROMLEY, CARTER, WATSON, DIMMER, REYNOLDS, McNAIR, COLLINGS-WELLS, LUMSDEN, NELSON, HALLOWES & HARTLEY. A brass memorial to him can be seen in St Michael's Church, East Peckham, Kent. Son of Mr. and Mrs. John Norwood; husband of Lilian. 7 - 10 September 1914. The pivotal moment of the Great War that reversed the German advance. The BEF had been in constant retreat since its initial encounter with the Germans at Mons on 23rd August 1914, usually marching over 20 miles each day. Eventually it became clear that the German pursuit was losing focus as it struggled to maintain momentum and an opportunity was spotted (with the help of the innovative use of aircraft) to hit the German flank as it passed by Paris. The shock of the attack by the French 6th Army coupled with the stand on the River Marne, created the conditions for self doubt in the German High Command and the order to disengage and retreat was given.